Add instant feedback to any door security system with the Aperio Sensor AS100. The new sensor from ASSA ABLOY maintains the integrity of a security system by detecting and transmitting door status information. The latest addition to the Aperio range of security solutions displays the current status of a door—open or closed—and notifies the control system wirelessly via the Aperio 1-to-8 Communication Hub. 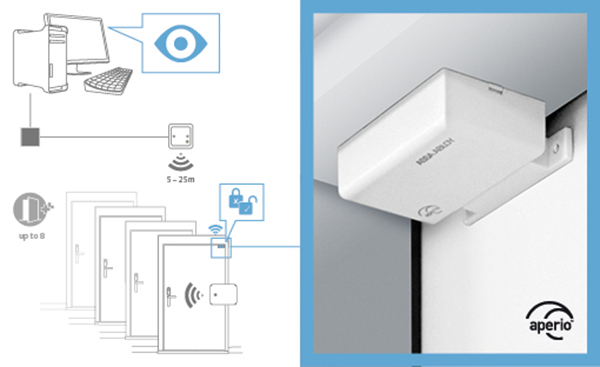 The AS100 works as a standalone wireless device—fully compatible with already installed doors equipped with electronic Aperio cylinders and escutcheons—or in tandem with other products from the ASSA ABLOY Aperio range, if required. Aperio wireless door sensors are battery operated and can be positioned up to 25 metres away from an Aperio 1-to-8 Communication Hub, which integrates the door with the computerized access control system. They blend unobtrusively into the environment, thanks to small dimensions and wireless design. About Aperio: Available on the global market place, ASSA ABLOY’s Aperio Technology now enables a wide range of access control providers to cost-effectively integrate non-wired doors with mechanical locks into access control systems.